Which form plugin is the better alternative for my blog? With more and more competing premium WordPress plugins it gets harder and harder to answer that question. This article takes a look at two popular WordPress form plugins: It compares Gravity Forms with Formidable Pro in order to help you with your decision in choosing one. There are several other alternatives to Gravity Forms and Formidable Pro on the market which I have compared in separate articles. Go to my main WordPress Form Plugins comparison to start your search. Please note that this comparison only looks at the features on paper as reported by either plugin’s developers. It does not and can not tell you if or how well a certain feature will work for you. 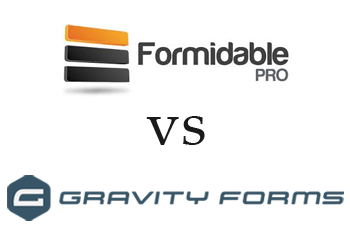 Because such a verdict would depend on too many variables, including your server setup and personal preference, I have decided to stick to the hard facts for this feature comparison between Gravity Forms and Formidable Pro. In my comparison I track 31 different features for all the form plugins. In Gravity Forms you can find 21 out of 31 of those features. Formidable Pro on the other hand offers 18 out of the 31 features in total. Even if many of the features compared above overlap between the two competing products there is one very important difference: Gravity Forms as well as Formidable Pro both provide a unique interface from which you will create beautiful forms on your WordPress blog. Since it is hard to rate the quality of such an interface objectively I recommend that you try both products yourself before deciding for one. WPscoop indexes the exact prixing plans of all compared plugins. Please refer to the table below for a quick overview of the prices of Gravity Forms and Formidable Pro. To find the cheaper form plugin for your individual needs please go to my main comparison article. There you can search for the features you need and then see the exact price you would need to pay for Gravity Forms or Formidable Pro (as well as other alternatives). You can have a look at the Youtube videos below to see Gravity Forms and Formidable Pro in action. That will give you a better idea of how the interface looks and which of the two WordPress form plugins is easier to use. Visit the developers website to learn more about each of the form plugins and order or download the software. Most WordPress plugins have an option to test their service for free, either thrhough a basic free version, a trial period or online demo. Check if such an offer exists for Gravity Forms and Formidable Pro and if so: Make use of it! By doing so you can compare both plugins directly and find out which one is the better alternative in you situation. But wait, there is more! Besides Gravity Forms and Formidable Pro I have compared several other WordPress form plugins on WPscoop. I recommend you start your search for Gravity Forms alternatives or Formidable Pro alternatives in the main comparison article. There you can filter all different products and search for the features you need. Which one is the better WP form plugin: Gravity Forms or Formidable Pro? Please share your opinion or experience in the comments! Thanks for the comparison. It was very informative. Just wanted to point out that since you wrote the article, Formidable Pro now has front end editing, Authorize.net & Stripe. The pricing table has changed as well. I own developer versions of both Gravity Forms and Formidable. I would like to point out a small but important difference in how they handle PayPal transactions. Gravity Forms handles both one-time and subscription PayPal payments easily. By subscription, I’m talking about when the person filling out the form agrees to pay a specific amount every week/month/year. There may be a set number of payments or the payments may be infinite. This all works perfectly in Gravity Forms. Formidable does not handle PayPal subscription payments out-of-the-box. Some people have hacked some of the php to do this, but I’m not crazy about that solution. I, and many others, have requested this feature in the Formidable user forum. In fact, the thread for PayPal subscriptions is over 2 years old. Formidable claims it’s high on their priority list. I find that hard to believe. I know you have check marks for both GF and Formidable in the PayPal field. I would give Formidable half a check mark. I have had multiple customers request PayPal subscriptions for their business and I can’t use Formidable for them because of this limitation. But I still think Formidable is pretty awesome for forms that don’t require PayPal subscriptions. There is also WP E-Signature by ApproveMe (which is less of a form plugin and more of a document signing plugin). They focus 100% on legally binding documents (UETA & ESIGN compliant). No monthly fees. Use your WordPress website to sign documents. Gravity forms and Formidable Pro is great for form automation but for signing legally binding documents it carries as much weight as a limp handshake. It is by far the most customizable document singing application built for WordPress. Unfortunately they doesn’t communicate that very well. Guess it’s part of the plan. I paid 47 for a so called “standard license” which is now limited to one single site. It looked pretty clear to me when I visited their site. Then again, I’ve had experience using other premium themes/plugins with multiple tiers available, so I knew what to look for when reading the pricing page. I suppose if this was a new experience, you might not have realized the difference. It would be nice if Formidable would have allowed you to upgrade by just paying the difference… especially if you were a new customer and didn’t want to “dive right in” with a full account until you had a chance to try out a single account first. I know they might argue Formidable also has a free version and that should be enough for a basic test drive, but Formidable Free is VERY limited compared to the Pro version, or to other WordPress form plugins which are 100% free. I purchased the individual and the upgrade does show the difference. Planning to upgrade to Enterprise. Just browsing different blogs for comparison before I jump all the way in. You must not have been the only person to complain. I assuming they made the change recently. Gravity Forms now supports Stripe with a developer account. Thanks for the info, I will look into that and update the comparison. I’ve seen several suggestions now that Formidable Pro is better at handling post type creation — Have others find this to be the case? Cause I have been trying to get Gravity Forms (which I otherwise love!) to do this and it seems unnecessarily complicated to map fields. These days I test Formidable, Gravity and Ninja and it looks like Formidable is really the most powerful and probably will use Formidable for all my forms. For creating posts it looks the easiest option for me also. Formidable already release new beta and it looks amazing. All forms – Gravity, Ninja and Formidable offers 30 days money guaranty, so buy them all and choose what you like the most. Do either of these work on Internet Explorer? I’m losing brain cells trying to get Formidable Pro to work…is it even possible? Save Form Progress is supported by Formidable Pro if the user is logged in. Thanks for the notice. I will check that and update the comparison. Does formidable pro really support multi-page forms? Because Chris Lema says it doesn’t support this feature. Have you tried that with formidable? Yes from my research Formidable Pro supports multi-page forms, see for example here or here. I have not tried using this feature myself however. My comparison of form plugins is based on publically available feature and price information only, not on any personal judgements. Chris Lema seams to hate Formidable Pro. Maybe they don’t pay enough to their affiliates. I didn’t gather that sentiment at all. In fact, I’ve personally heard Chris Lema remark that he tries not to favor one over the other in his comparisons. Just lays it out and let’s you decide. He ended by suggesting you buy both!